Koreans feel that the spicier the food, the better for stress relief, and osam-bulgogi is one of the most popular spicy Korean dishes. 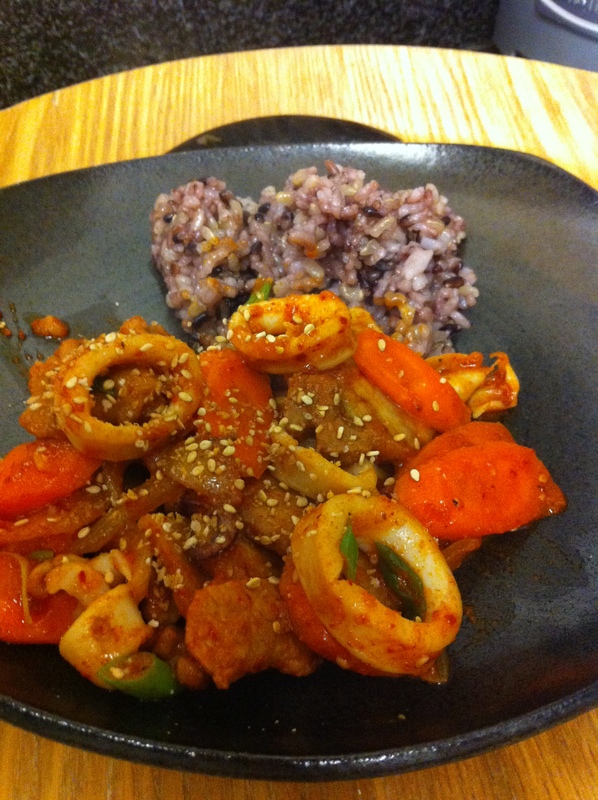 This dish is sautéed squid and pork in spicy sauce with various vegetable of your choice. You can also choose to omit the squid or pork. 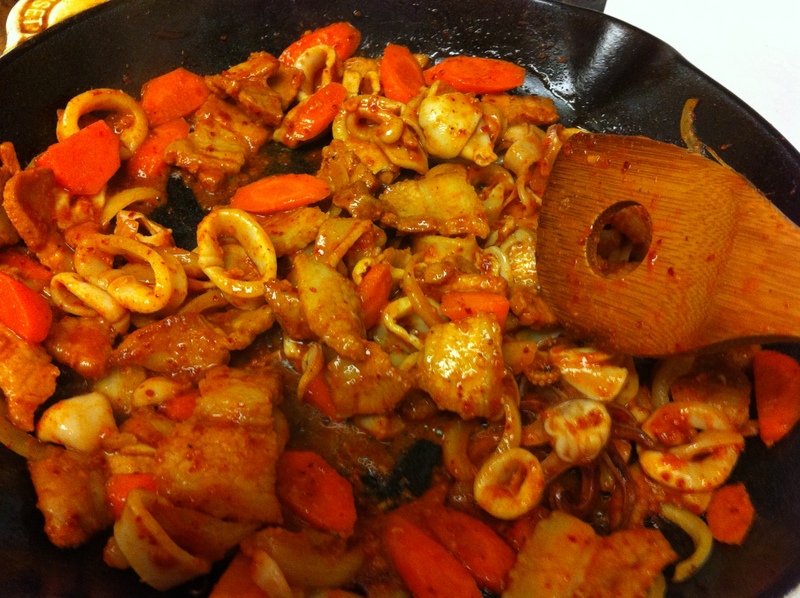 The best part of about this dish is that like bulbogi sauce, I make at least double the amount of what I call “Korean Spicy BBQ Marinade” that I plan to use then cook other dishes such as “Dubu-Kimchi (두부김치, Kimchi-pork with Tofu)” at a later time. Another great option is if you have leftover osam-bulgogi you can chop up everything is small pieces and sauté the leftovers with rice to make a delicious spicy fried rice. In separate bowls, mix the sake (or mirin) with the squid and pork belly 1 tablespoon each. Mix all the marinade ingredients together. After a few minutes, add 1/3 of the marinade each to the squid and pork belly and refrigerate for at least 30 minutes. Drizzle vegetable oil onto a large skillet heated on medium-high heat and sauté the pork belly first. When the pork is half-done, add the squid and sauté. Add rest of the vegetables and sauté. I used onions, scallions and carrots today. 5. Taste and add the remaining 1/3 of the marinade if needed. This prevents the dish from being too salty or spicy. 6. Finish by drizzling the sesame oil and sprinkle of toasted sesame seeds. You can use any variations of vegetables such as bell peppers, mushrooms and carrots but do not forget to add scallions and an onion. Jalapeños and red peppers make it extra spicy. If you cannot find pork belly, you can always replace it with a fatty pork cut. 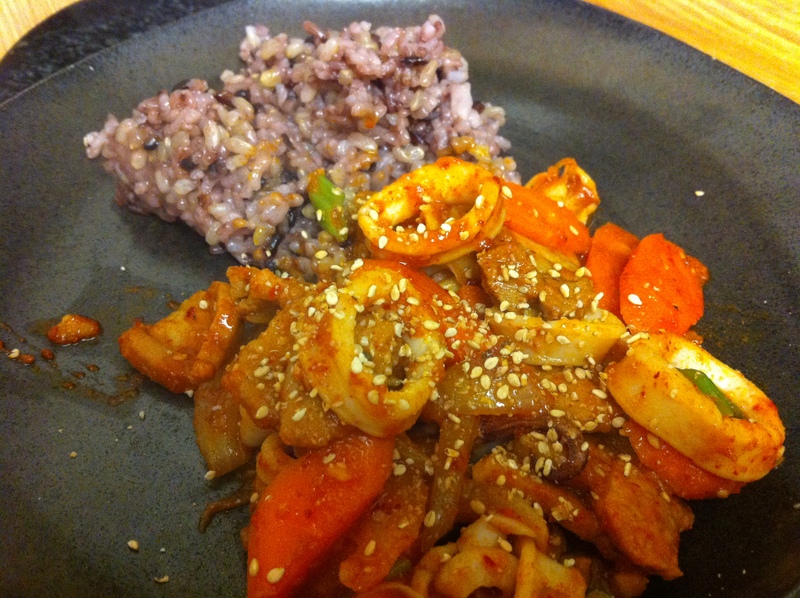 It is delicious to add rice cakes if you have them on hand. The use of sake and mirin in Korean cooking is to get rid of fishy or meaty smells of the ingredients and are usually interchangeable. The difference is that mirin is usually used in sweeter dishes and sake in savory ones. I usually buy a large bottle of cheap sake from a local liquor store for cooking. Mirin can be found in most supermarkets these days. I prefer to use rice syrup bought in Korean supermarkets because it seems healthier but it is fine to use regular corn syrup. This entry was posted in Good for dinner, Main Dish, Meat/Chicken, Seafood and tagged Korean BBQ, Pork Belly, Samgyupsal, Spicy Korean BBQ Marinade, Squid by gangnamkitchen. Bookmark the permalink.